And we’re ready to begin another winter in New England. For the first time, fingers crossed, we’re fit for travel on the road. 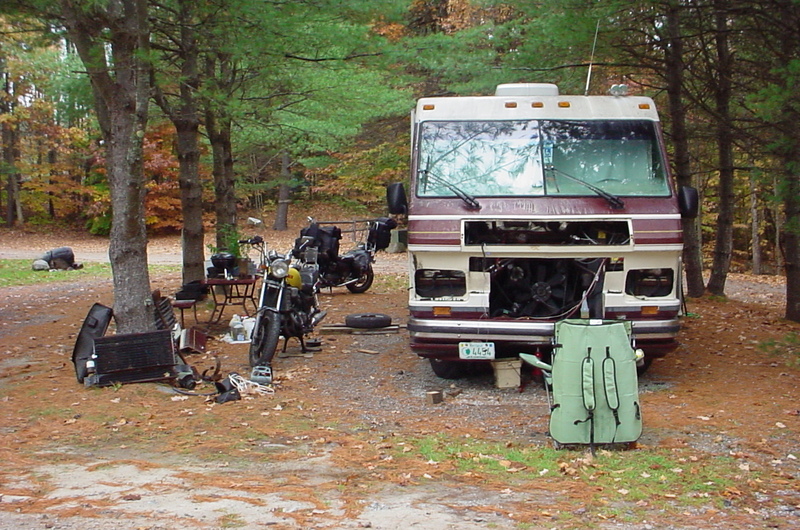 With the gracious permission of the Oxbow Campground in Deering, NH I’ve been able to remove the radiator and have it repaired. 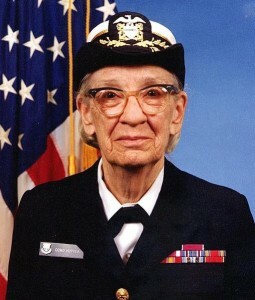 Grace Hopper remains a source of quotable quotes, our favourite being: “It’s easier to ask forgiveness than it is to get permission”. Well, Tom Irving didn’t exactly give permission for major repair work. He graciously gave us permission for us to stay until the end of October, which is another 15 days past the Oxbow Campgrounds closing date of 15 October. I’ve learned through experience to live by the great Grace Hopper’s dictum “It’s easier to ask forgiveness than it is to get permission” and I did and I got. This is our home with the grill removed to allow access to the radiator and front engine accessories. First I tried to remove the upper radiator hose. The lower radiator hose wasn’t too bad to change out but the upper one was impossible to remove from the radiator. After much angst I realized that I was gonna hafta remove the radiator. I had been entertaining, keeping the dream alive that all of my coolant leaks were the result of a heater host that only leaked when hot and under pressure. I started off by removing the big piece of fiberglass that holds the headlights and unites the front fiberglass into one piece. Next I vented the R-12 to the atmosphere, crying all the while over the loss and removed the AC condenser, cold air intake, washer bottle, coolant overflow and whatever else was in my way. The oil cooler lines were easier and harder than I expected. The engine oil cooler can be and was disconnected underneath the radiator but I had to reach up alongside the radiator to disconnect the transmission oil cooler lines. The skin on the back of my hands will heal. Now I started this on a Friday, so I had Saturday and Sunday to look for problems before I had to deal with the radiator, so after I got the radiator out and realized that the water pump wasn’t obviously bad I had time to remove and replace the water pimp and the engine driven fuel pump. The original equipment water pump does have 50,000 miles and 30 years of time under its belt while the fuel pump is the next suspect in a lean misfire condition and it was either fit an $80 fuel pressure gauge and monitor the fuel pressure while driving or replace the fuel pump for $30. I really wanted that fuel pressure gauge but I wasn’t willing to run fuel under pressure up to a $15 gauge in the dash. For $80 I would have bnought an electric gauge with a remote sending unit. 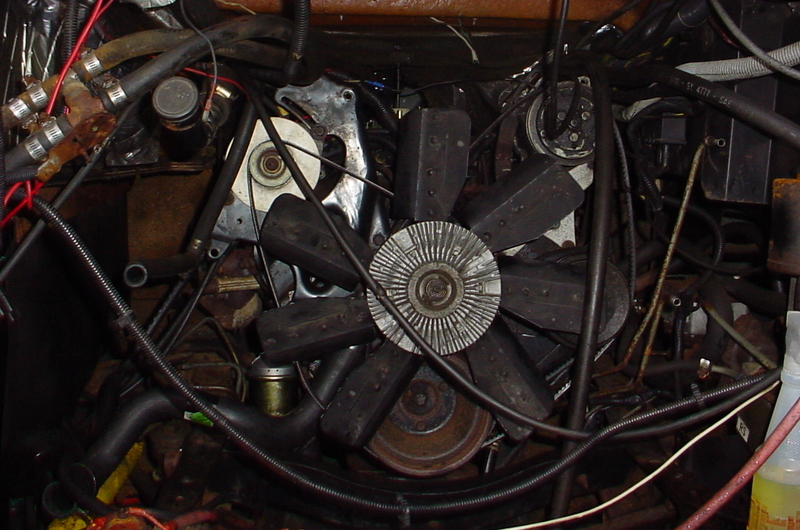 Closer view of the engine accessories mounted on the front of the engine. For the amount of time and effort necessary to get to this point it would have been the height of stupidity to not replace the fuel and water pumps. I’m probably going to kick myself for not changing the timing chain and sprockets but there was only so much time and money available for this project and the coolant leak was potentially fatal. With the fuel and water pumps changed out I turned my attention back to the radiator and rigged up a way to pressurize it with the original radiator hoses and a motorcycle valve stem. No pressure build up with my 12V air compressor. Now I had noticed that the heater return line to the radiator was sitting askew but I hadn’t focused on the seam right next to that fitting. For about 4″ the right hand tank was separated from the radiator core. From the top down so now I began really praying and chose to make a sacrifice of chicken thighs to the great god of GM cylinder heads hoping to find favor with him in this, my hour of need. I should have sacrificed a leg of lamb to the radiator god. I never took pictures of the area where the tank separated from the radiator core because I was too busy trying to get the damned thing repaired or find a direct replacement. And here’s where the wheels fell off the rails. This is why I hate farming work out but I’m becoming too feeble to do the work myself. Merrill’s Radiator in Concord, NH has now made my internet hall of infamy. Three strikes and you’re outta here! First they did the radiator for my Ford T Speedster, o-kay. Then I paid them to assemble the fitting onto my decorative oval gas tank for the same project and it leaked. I did it over myself. Then it didn’t leak. Third I dropped off my home’s main engine radiator with the instruction to remove and replace the side tank, clean and solder the tank back on and touch up and solder joints that were leaking. I expected to pick up my tank the next day. Instead of meeting my expectation I received a call that the radiator was unrepairable as it was and it would be $650 to repair properly with a new core. So I drove down and picked up my radiator now having lost two days of my time, paid $35 instead of his “normal” $45 charge for inspecting a radiator and went home. Lynn found Bob Rondeau’s Radiator Repair 65 River Road in Bow, NH and after a telephone call Lynn proclaimed “This is a guy we can work with.” Bob gave a price over the phone of $90 to remove and replace the tank AND to rod out the radiator tubes ! so back on the bike and off I went, my trusty radiator riding pillion behind me. I liked what I saw when I arrived, he agreed the radiator was in good shape and asked me “Are you sure your head gaskets are good?” And I replied, “No.” He couldn’t do it the next day but it ws done the day after that so it’s now Friday and I started this odyssey on Monday but when I arrived there was my baby having had the tank removed, 12 tubes rodded but no significant debris found, the tank replaced and after pressure testing a few tubes were resoldered along with the ins and outs where solder bloom had done its damage. Bob said $80 and I gave him the $90 and was happy with every penny spent. After all was said and done I got Lynn to the hospital on time and after one scare with a leak from the heater bypass valve all is well and good. With proper temperature control, coolant contained where it belongs our home is more of a pleasure to drive.